I have a long and happy history with the Worms series of games. Many a night that should have been spent studying for my college classes was frittered away with my dorm roommate in epic duels of Worms 2. Similarly, I have played just about every iteration since. So, yeah, Worms holds a special place in my heart. That's why I was so excited to have the opportunity to preview the latest game in the series. I sat down with Team 17 at GDC to see all the new weapons and environments, only to discover that the biggest change to Worms is a return to some truly classic gameplay. Read on to see how they've managed to both faithfully recreate a beloved game while adding enough compelling ideas to make it all continue to feel fresh all these years later. Worms is, apparently, incredibly popular on Xbox Live Arcade. Team 17 claims that, in 2007, there were more sessions of Worms played than any other game on the service and sales kept it consistently in the top ten for almost every week of that year. It's a little staggering to think that a game which has existed with fairly minimal gameplay changes over the course of more than a decade continues to remain so popular but it proves that a winning formula can be timeless. 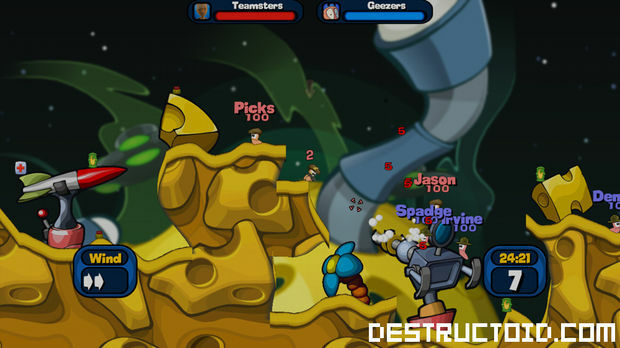 Of all the titles in the franchise, the most popular and enduring among fans is Worms: Armageddon. It is this version of the game which is the inspiration for Worms 2: Armageddon, coming to XBLA in the very near future. Great pains have been taken on the part of Team 17 to recreate the experience of playing this classic entry, even going so far as to create testing levels for the sole purpose of exactly replicating the physics. 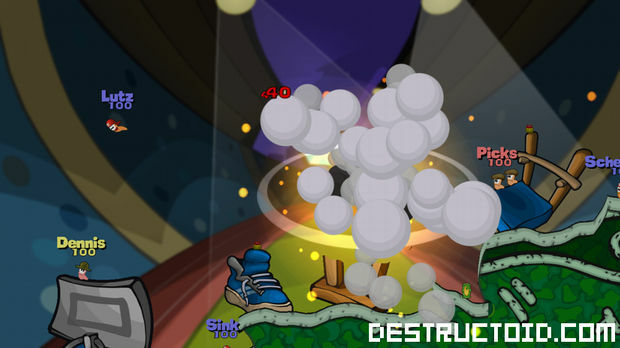 Original weapons from the game which were absent from the first XBLA Worms will be making a re-appearance as well. The devastating Holy Hand Grenade is now back, complete with its "hallelhujah" chorus. Super Sheep, explosive livestock which can be manually flown into targets are returning too, along with the Concrete Donkey and the apocalyptic Armageddon attack that rains meteors across the field of battle. The new weapons being added to the game are highly interesting as well. A new Electromagnet can be dropped on the map and has two polarities, attract and repel. Metal objects, such as landmines and missiles (including those from an Air Strike) react to the magnet, either drawing them in or flinging them wildly through the air. It's highly chaotic and offers interesting opportunities for both offensive and defensive play. If you've played Worms, you've probably encountered players who burrow complex tunnel systems to evade attack, preferring to wait out the storm, coming up only to deliver final, killing blows. If you're one of the people who does this, I hate you and so does Team 17. That's why they've introduced some new countermeasures to the strategy. 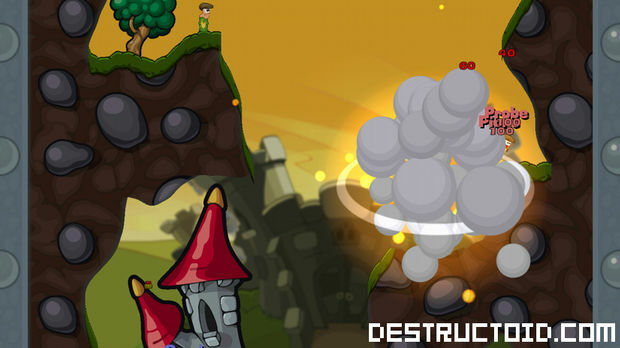 A Bunker Buster bomb can be directly dropped (via plane) anywhere on the map and, upon impact, drills deep into the ground before exploding out horizontally, opening up caverns to attack. A Gas Pump has also been included, which can fill a huge network of tunnels with poison gas that depletes enemy health after every turn. Another weapon with unpredictable results was shown. A Lightning Strike sends a bolt of electricity wherever you target with varying effects. If it strikes the gravestone left behind by a deceased Worm, for example, the Worm returns to life. When lightning hits a magnet, its polarity is reversed, making repelling magnets now a very dangerous thing to stand next to. I've been told that there are other applications for a Lightning Strike which Team 17 has decided to keep quiet on for the time being, so there still may be a fair bit of cool tricks to discover with the new tool. The charm of the annelid heroes remains a major part of the game, and teams can be customized more than ever before. In addition to setting the color of your Worms and what type of gravestone they leave behind, hats can be purchased in the game's shop with coins earned through gameplay. Worms also can now have different victory dances, which are all adorable. And the collections of speech files remains and introduces some new voices, including a set which is nothing but puns about cheese (which every game should have as an option, btw). 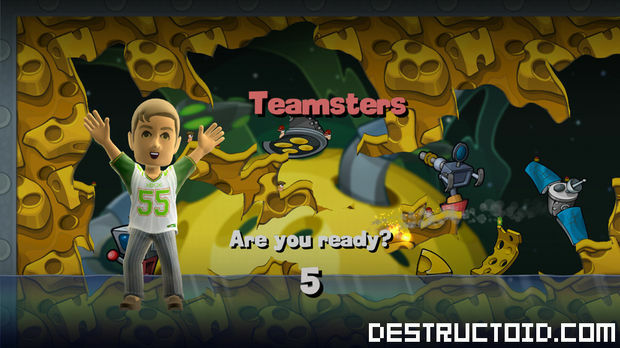 Several game modes have been added in addition to the standard play. 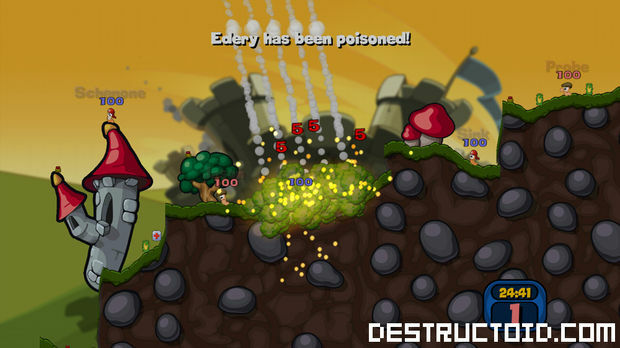 There is now a more "artillery duel" type of game in which Worms defend castles on opposing ends of the map and must lob attacks over without being able to move in close for a kill. Another mode has players begin wholly unequipped but crates with all sorts of weapons and items cascade upon the landscape every turn. If you're interested in something a little less combat-oriented, there is also a Ninja Rope racing mode in which players compete to reach the far end of a map by only using the swing-and-fling mechanics of this fan-favorite tool. I'm very excited to be getting a new Worms at all, let alone one with this much polish and care applied to it. 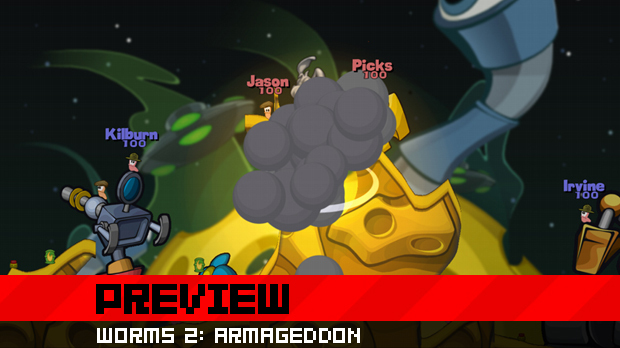 Backgrounds which originally appeared in Worms: Armageddon have been gussied up in high resolution and look fantastic. On the whole, this could be one of the best versions of Worms released yet and I'll be ready to plop down cash for it as soon as it is released. The game is currently going through Microsoft's certification process, so we should expect to be seeing it show up any time now.